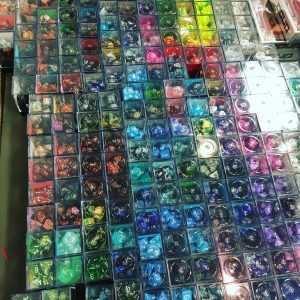 This past weekend was Terminal City Tabletop Convention! 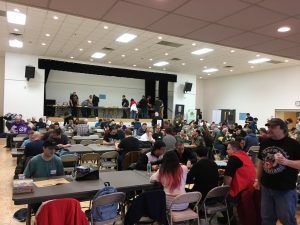 In it’s fourth year, our favourite gaming convention was back for two days at Bonsor Recreation Centre in Burnaby. Our attendance at it was a bit different this year. We’d bought tickets, but TCTC’s organizer, Shannon, reached out and asked if we’d be willing to volunteer. So instead of attendees we got to be volunteers! This year I DM’d my first ever convention game of Dungeons & Dragons 5e. I was nervous going in, but I’d spent a lot of time in the weeks leading up to TCTC prepping, so at least I was ready. My session was called “Intro to 5e” and it was meant as a learning game for newbies who were interested in tabletop RPGs or to 5th edition. I ran the 5e Starter Box, because it’s a great scenario to get people into 5e, it comes with pre-generated characters, and gives newbies a chance to dip their toes into the actual role playing side of things (rather than being so mechanics focused). My session filled up on sched.org a few weeks ago, which helped to bolster me a bit. It turned out to be a lot of fun! Day one hosts the ever popular Gamer silent auction. You can put games you no longer play into the auction for $2 per entry, and pickup new-to-you games for a decent price! We always bring in games, and always end up with a haul of new games. Blair and Aaron as Game Stewards, check out Tsuro. Photo by Rebecca Blissett at the Vancouver Courier. Blair volunteered as a Game Steward. 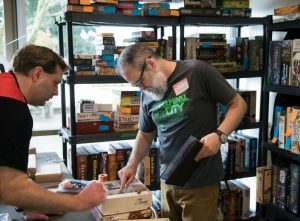 Attendees could borrow board games from the Game Library, and then Blair and other Game Stewards were on hand to teach the various games. It’s a great option for convention goers who weren’t able to get into schedules games. And if a game they wanted to play wasn’t scheduled, it was an opportunity to play it! In the evening we borrowed Dice City from the library. It seemed intriguing to try. It reminded me a lot of Machi Koro, in that you roll dice to activate powers, and have to build your city up to gain points. We enjoyed it so much it got added to our ‘to-acquire’ game list. We also tried a game called Bear Valley. Players have to follow a trail while avoiding bear attacks. Unfortunately we found the instruction booklet overly complicated and had to give up on it. We got to play Nevermore on Sunday. It’s a card drafting game somewhat like Sushi Go, except here you’re trying to build a suit of a certain type, and then attack your opponents. Not a bad little quick game. The artwork on it is really lovely. Blair helped to run a Pandemic Survival tournament. It’s definitely an interesting take on traditional Pandemic. Multiple Pandemic boards are setup exactly the same way (the player decks and outbreak decks). Cards are flipped at the same time, and whichever team of two can find a cure for the three viruses in the least number of steps, wins.